Use this novation agreement to transfer the right to receive a debt repayment from one creditor to another (i.e. change who will receive the debt repayments). Common uses are when a business is sold and the purchaser takes on the assets of the seller, or when buying the debts of another party. This is a simple yet comprehensive agreement that can be used to novate any right to receive a debt, usually with only minimal editing. The basic law is that A cannot transfer to C the obligations he has under a contract with B, without B agreeing. So what happens is that all three enter into a “novation” agreement whereby the proposed transfer is made with B’s permission. Usually, B will want payment or some concession for his agreement. The consent of all three parties - the transferee, the transferor and the other contracting party - is required to effect any novation. Unless you specifically require the consent of the other contracting party (perhaps because your contract has a non-assignment clause), our assignment agreement may be an even simpler way of transferring your contract to someone else. Why not a deed of novation? 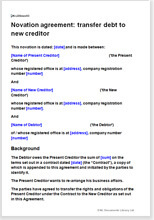 The deed format is used where one party to a contract receives no consideration. However, a novation is invariably "for value", and as such, a deed of novation confers little additional advantage. In the unlikely event that a party agrees to novation out of pure kindness, the consideration can be entered as “one pound”, or a "peppercorn". The sum does not need to have any relation to the value of the debt being novated. A common misconception is that novating a debt cancels an old debt and creates a new one to the new owner. Instead, novation just changes the parties to the original contract. In most cases, novation is an easier option than cancelling and drawing new agreements. This document can be used to transfer any debt between a creditor and a new party provided that the debtor agrees to the transfer. If you want to transfer the debt to another debtor (i.e. change who will repay the debt), then use of the Novation agreement: transfer debt to new debtor agreement will be more suitable. Other usual legal provisions in plain English.